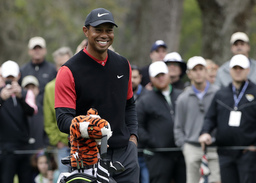 PONTE VEDRA BEACH, Fla. (AP) Tiger Woods hit 12 of 14 fairways, made a 30-foot putt for birdie and holed out for par from a greenside bunker in the final round at The Players Championship. Woods' lone blunder - his only score worse than bogey all week - was a quadruple-bogey 7 at the famed par-3 17th in the second round. Woods put two balls in the water en route to matching his worst score on any par 3 in 24 years on the PGA Tour. "I was close," Woods said. "I know the score doesn't really indicate that, but this is one of the golf courses that - there's some weird spots here. It was fun to play but ... this is probably the most stressful golf course you ever play when there's wind out here.